I usually make boxes for the boys with something other than the invitation on top. I figure most boys are going to grow out of looking at it pretty quickly. Surprisingly a lot of moms tell me that the boys do use their boxes, keeping their watches, nice pens, baseball cards, usb sticks or just plain junk in them. Sometimes I go with a stone agate for the top, other times people are able to tell me what he’s into like sports, music, etc. What I love about doing these invitation boxes is that each and every one comes out different – I’ve even done three sets of twins in the past, and each of those were customized to the tastes of the individual. That’s what makes it fun as an artist, these are all unique. I absolutely blown away by the beauty of your boxes. 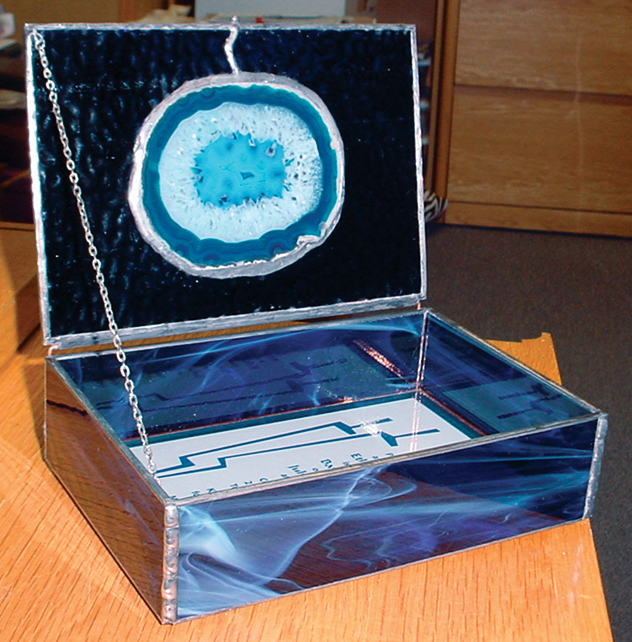 How do I make arrangements to order a stained glass box with my daughter’s invitation?